A Girl and Her eBooks: Triple Chocolate Murder by Sally Berneathy - $0.99 Goodie! 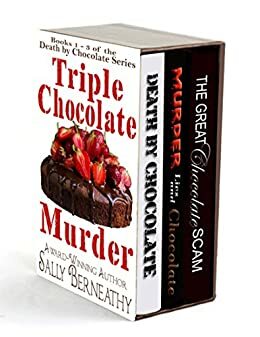 Triple Chocolate Murder by Sally Berneathy - $0.99 Goodie! Rodney Bradford comes into Lindsay's restaurant, eats her brownies, and drops dead on her sidewalk. Lindsay enlists the aid of her enigmatic neighbor, Fred, to help solve the mystery of his death while trying to keep her police detective boyfriend, Trent, from getting in their way with his insistence on all those silly cop rules. After two years of waiting, Rick has finally agreed to sign the divorce papers and give Lindsay her freedom. But while she’s waiting in her lawyer’s office for him to appear, his car blows up in his driveway. Lindsay is left with an image of her estranged husband’s green SUV flying around the neighborhood along with pieces of Rick—a blue contact lens in Mrs. Hawkins' driveway, a perfectly creased trouser leg hanging on the street sign, a vertebra on the immaculate lawn. Since their divorce wasn't final and Rick has no family, Lindsay assumes she is his only heir. But before his estate is settled, poor orphan Rick has more relatives than a lottery winner. Is the obnoxious Rickie Jr. really Rick's son? Why is the woman who claims to be Rick's mother so certain the child is not her grandson? Are these people really related to Rick, or was he actually an alien stranded on earth when the mother ship left without him?